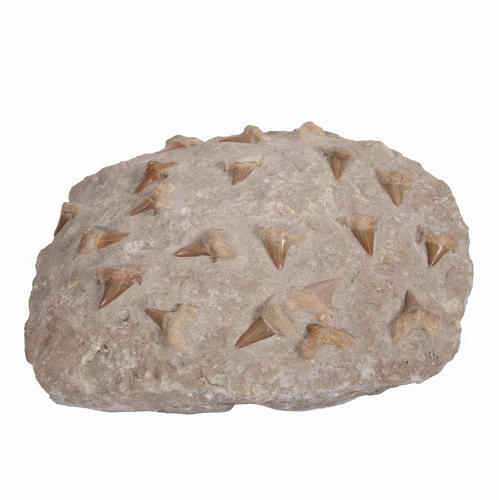 This is a fantastic example of shark's tooth fossil, with multiple teeth fossilised in the matrix in which it was found. Sharks continually shed their teeth, and some sharks can shed approximately 35,000 teeth in a lifetime. A tooth becomes a fossil when it is buried in sediment soon after being lost from a shark's mouth. The sediment precludes oxygen and harmful bacteria from reaching the tooth and destroying it. The general fossilization process varies greatly depending on the exact situation. In general it takes approximately 10,000 years for a tooth to become a true fossil.